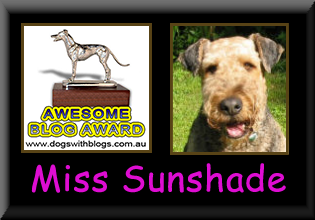 Life of Miss Sunshade - The Vancouver SuperDALE: I have a TENT!!! 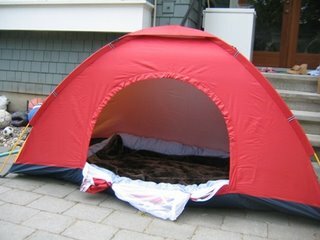 I'm so excited because I have a tent of MY OWN!! Mom saw it last night at the Night Market and thought it could be my own little get-away in the backyard. So she bought it for ME ME ME! 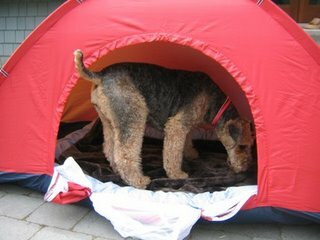 It is a one person tent so it's just the right size for me and my bed. It has been quite warm here and all the heat from the day get cooped up inside the house making it hard for us furry little ones to sleep in at night. I have been asking mom to let me sleep in my fully fenced yard for the last week, so Mom has put a small foam mattress with a heating pad out in the yard for me to sleep on. 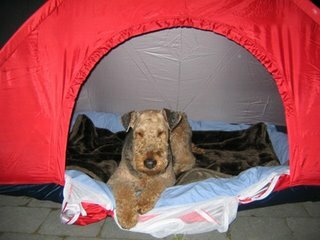 Now it is even cooler with my tent!!! I love to sleep in my yard at night because that is the time when all the little critters come out and I get to patrol my yard. I have my plan all worked out! 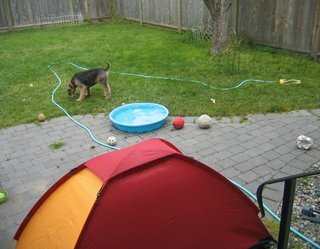 I will hide in my tent, which is facing the back of the yard, and wait for intruders to come. As soon as a trespasser flips over or under the fence, I will come out from hiding, and ........ well.....you know what happens next!! 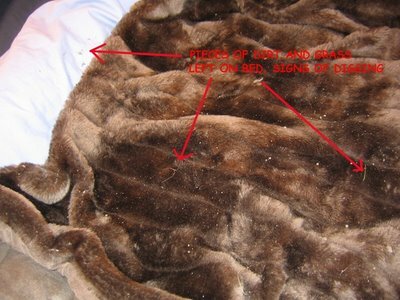 Another reason that I love to sleep in my yard is because........Shhhhh.......this is a secret...don't tell mom ok? I get to dig my heart out and mom won't be able to stop me!!! 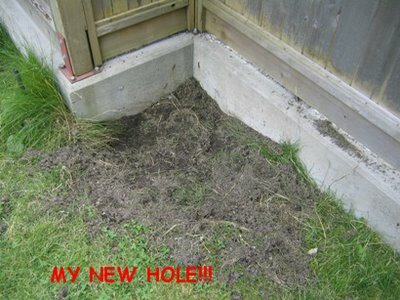 Mom has already left one hole for me to dig in the yard, but look at what she woke up to this morning........hehe. I was questioned about where the "new" hole came from, and I told mom it was the raccoon family that lives on the big Oak tree behind our yard. HAHAHA...I think she believed me!!! Come on, honestly, any Airedale in its correct mind would not waste a golden opportunity like this to DIG DIG DIG DIG DIG!!!! OH......those pieces of dirt and grass came from the raccoons, I lend them my bed since they were so tired from all that digging ya know!